"Although the bending load of product is OK, it is not applied to why or a making boxes machine." Isn't such a thing? However, it is a natural thing. 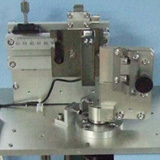 The measurement machine which has appeared on the market in the world is not following an actual maiking boxes machine. The bending stress tester "CST J-1" can carry an automatic high-speed bending function, a repetition bending function, and a creep function, and can carry out quality assessment in accordance with the present making boxes machine. The "CST J-1" can hold the angle after rotation according to a set period, and can evaluate a change which time depends. Moreover, it is possible to also make repetition bending operation perform continuously to 3 times in a measuring range set up beforehand. Thereby, evaluation of repetition bending operation is also possible. it has a clamping mechanism for the corrugated paper use, and measurement data can also be saved in a USB memory by CSV. It is 90 degrees in the case of a ratchet clamp. Externals and the specification might be changed without a previous notice for the product improvement.